Check out our review of the Google Nexus 5 smart phone. All rumors should be treated with skepticism, but this one concerning an image purported to be of the Nexus 5 is particularly suspicious. Why? It’s because of the long feature list it’s accompanied by, which reads like a bit of a fanboy wishlist. 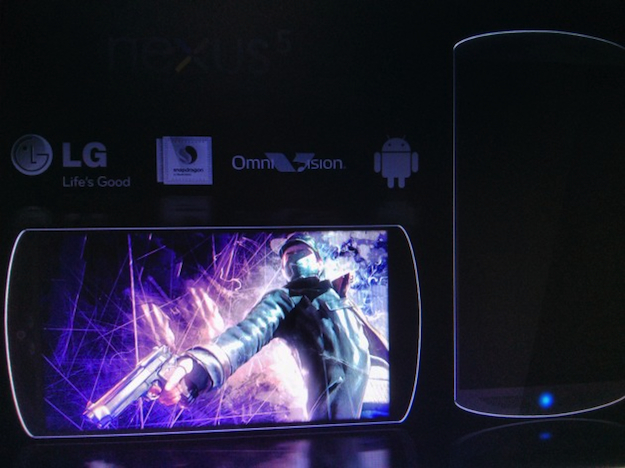 The picture apparently comes from a Google employee, and shows a phone in render form, complete with a few logos including LG’s. As you know, the Nexus 4 was built by LG, and Samsung built two Nexus phones in a row, so it wouldn’t be a surprise for Google to choose LG to build another model. However, it’s supposedly only one of the prototypes which Google is examining, as the Nexus 5 may not be introduced until October. The phone has the codename Megalodon, and here’s where things start to get a little unbelievable. Apparently it’s powered by a 2.3GHz Snapdragon 800 processor and 3GB of RAM, plus a 16-megapixel camera which will record 4K video at 30fps, and 1080p at 60fps with HDR and image stabilization. The screen will measure 5.2-inches and have a 1080p resolution, plus it’ll come with a 2.1-megapixel camera, a 3300mAh battery, stereo speakers and 16GB, 32GB or 64GB of storage space. We know Qualcomm’s Snapdragon 800 processor is coming after the summer this year, and it’ll have the ability to shoot 4K video and support high-megapixel cameras. There’s no question it’ll be able to do these things, but we’re not sure it’ll do them just yet. Specifically, it’s the 4K video feature which really makes us question this one. With 4K televisions still far from being mainstream thanks to massive prices, there seems little point in squeezing in the technology to shoot it when so few people have the means to replay files of that quality. Not only that, the files are pretty large, with the 52 minutes Timescapes 4K film coming in at 160GB. The idea of a 16GB phone with 4K video recording is quite amusing. So, take all this as you will, but we’re not convinced at all. With an external capture device or "capture card," anyone with a gaming system can become a YouTube or Twitch star. But which one should you choose? These are the best capture cards.